I will be starting a Cooking Klatch with neighbors who are busy Moms & Wives. They are interested in quick, easy and nutritious meals that are “home-cooked” but easy and quick. Piece of cake! I am so excited to get started. The recipes, tricks & tips and hopefully some videos (squee!) will be posted here for anyone to access. We’re going to start with wine…er, I mean a list of healthy pantry items to have on hand all the time to enable you to “cook-on-the-fly,” if you need to. 3. fresh or frozen veggies? Once we get those nailed down we can move on to getting the meal put together. 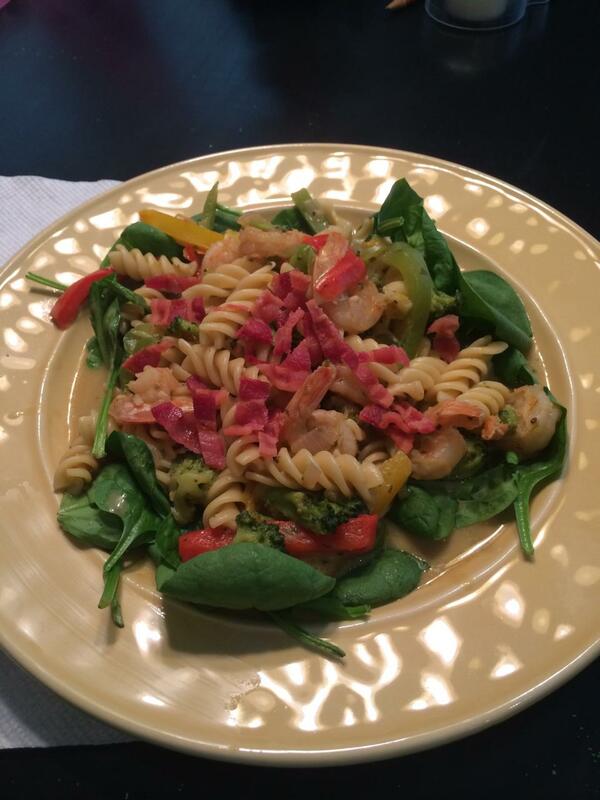 Protein: she had frozen pre-cooked shrimp on hand she wanted to use. Pantry: Veggie and Chicken broth/stock, a jar of Pesto. Fridge: Laughing Cow cheese wedges, fresh peppers, 1/2 medium red onion, fresh mushrooms, and fresh pre-washed bagged spinach. Finished product: Shrimp ala Fredo with whole wheat pasta. Put your water for pasta on to boil FIRST! We then moved on to making our mise en place with our veggies by cutting the red, green & yellow peppers into thin strips and cleaned and sliced the fresh mushrooms. We diced the red onion. Sauce: We put our diced onions and mushrooms in a skillet to saute with some olive oil. Approximately 5 minutes, once the onions were translucent we added the broth, about 3 cups. We added the Laughing Cow wedges (about 6), this we had to work on with a whisk because the Laughing Cow wedges will not break down or “melt” easily and 1/4 prepared pesto (or to taste) dried Italian seasonings (to taste) salt & pepper (again to taste). We made a slurry of water & cornstarch (about a tsp of cornstarch to a Tbl of water/broth). We added the slurry to the sauce stirring constantly and reduced the heat to a very low simmer for about 2 minutes. The water for the pasta was boiling, so we put the pasta in, boiled for about 8 minutes, added the peppers and frozen broccoli to that boiled for another minute or so, just to thaw the broccoli and make the peppers crunchy tender. We drained all of that and ran the pre-cooked shrimp under cool water to thaw. Added the shrimp to the sauce. Plating/Serving: she decided she wanted to serve the entree individually, so we put a hand full of fresh spinach on the plate a serving size of the pasta veggie mixture and sauced it with the Shrimp ala Fredo Sauce. Voila, dinner in less than 30 minutes! Her family loved the dish, she was happy they were happy which in turn made me happy!